In a report published Tuesday night, just before President Trump started his State of the Union, the Washington Post revealed that it had discovered a document where 2020 Democratic presidential contender Elizabeth Warren, who was exposed by a DNA test that backfired late last year for having a negligible amount of Native American heritage, listed her race as "American Indian" on a registration card for the Texas State Bar in the mid-1980s. The card lists Warren's name, gender and the address for the University of Texas law school in Austin, where she was working at the time. On the line for "race," Warren wrote: "American Indian." Meanwhile, lines for "National Origin" and "Physical handicap" were left blank. 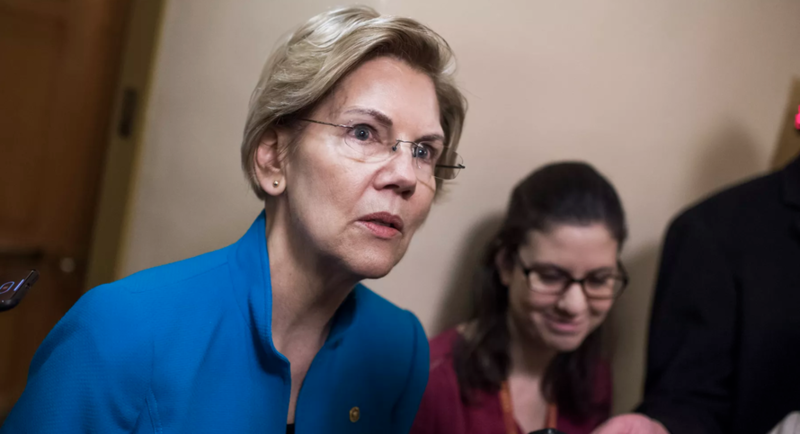 One spokeswoman said Warren was sorry for "not more mindful of this" (presumably referring to the risks that this would all blow up in her face later in life), when she was younger, and for falsely identifying as a Native American for more than two decades. According to WaPo, the card, dated April 1986, is the first document to surface showing Warren claiming Native American heritage in her own handwriting. Her office didn't deny the authenticity of the document. 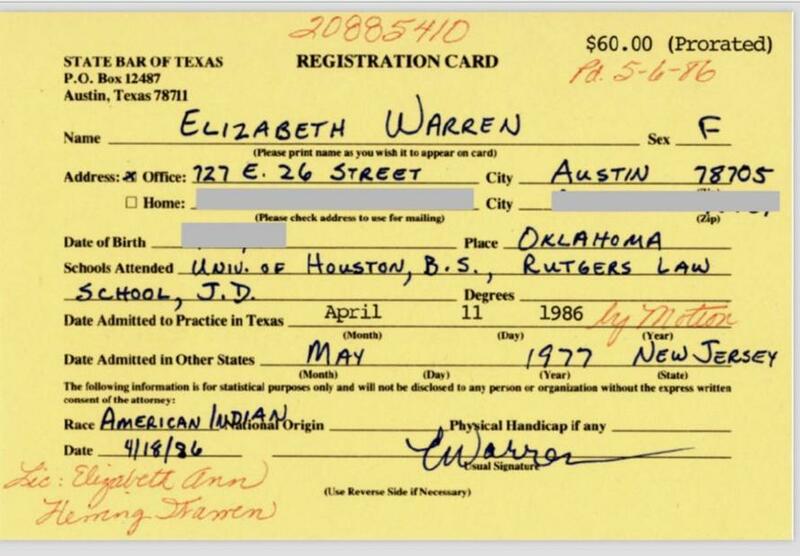 Using an open records request during a general inquiry, for example, The Post obtained Warren’s registration card for the State Bar of Texas, providing a previously undisclosed example of Warren identifying as an "American Indian." The card was filled out by Warren after she was admitted to the Texas bar. Her reasons for joining the bar are unclear: Though, at the time, she was doing legal work on the side, the work wasn't anything that required her to be admitted to the bar. The date on the card coincided with her fist self-identified listing as a "minority" by the Association of American Law Schools, where she reported herself as a minority in the directory every year beginning in 1986 (the year the Association started listing minority law professors). Her name dropped off that list in 1995. Warren also famously had her ethnicity changed to Native American from "White" in December, 1989 while working at UPenn, two years after she was hired. She also listed her ethnicity as Native American when she started working at Harvard Law School in 1995. In a sign that Warren's listing herself as Native American may have been more an act of self-delusion than an attempt to give herself a leg up in the world of academia, the card explicitly states that "the following information is for statistical purposes only and will not be disclosed to any person or organization without the express written consent of the attorney." Back in October, Warren's decision to release her DNA test results revealed that she had a negligible level of Native American heritage (possibly as little as 1/1,024 Native) while the stunt - which backfired spectacularly - angered leaders of the Cherokee nation, who, as WaPo explained, typically exercise tight control over the process of connecting individuals with the tribe. Warren's apology for that incident hasn't been uniformly accepted, and there are still some who want to see a more thorough apology from Warren.